In the wilderness of Japan, Leonardo and Splinter are dueling. 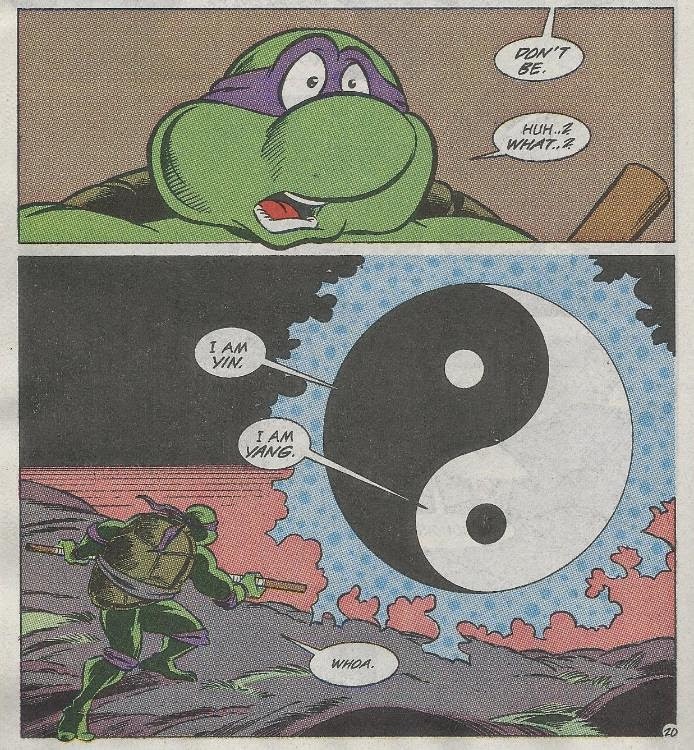 Splinter teaches Leo the basics of Zen, which are the roots of master swordsmanship; to simply “be” and nothing else. As Leo begins to grasp the lesson, Splinter calls their sparing off for lunch. Elsewhere, the Turtles, Ninjara, Fu Sheng, Chu Hsi, Oyuki and April have gathered for a picnic. The Turtles are repulsed at the idea of eating sushi, though Splinter thanks Sheng for preparing the meal nonetheless. 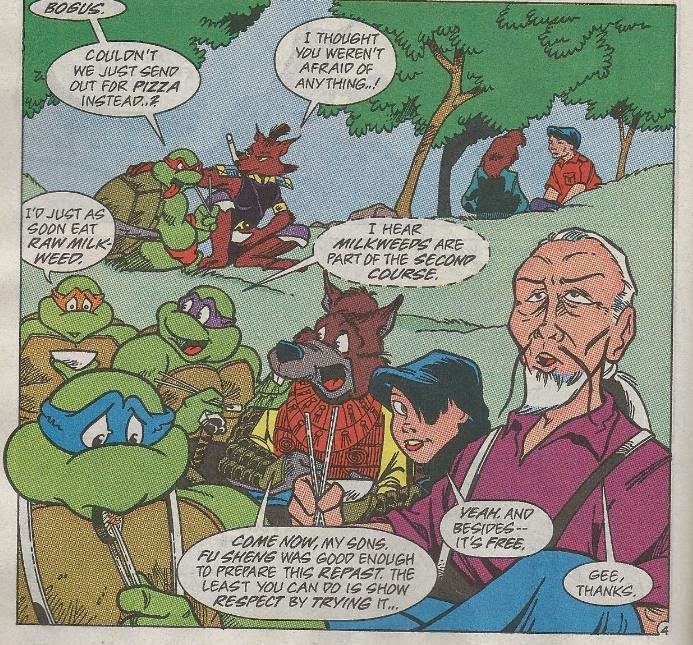 After eating, Splinter suggests that the Turtles explore the birthplace of the Foot Clan and their own origins as well, and that they do so individually. Raph and Ninjara head out to investigate the torii, where the evil from the underworld had seeped through. Mike goes with Oyuki to fly a Japanese kite. April continues a private picnic with Chu. Donatello goes alone to oversee the reconstruction of the demolished power plant. And Leonardo stays behind to continue his training with Splinter. Raph and the slinky Ninjara check out the torii, which Ninjara explains is a gateway to the realm of demons. Though typically a large amount of power and the proper incantations are needed to activate it, sometimes an open mind is all that is required. As she speaks, Raph begins to hypnotically march toward the torii. Ninjara sees what is happening and pulls him back, remarking that his mind must be full of negative energy in order to appeal to the demonic forces within the torii so quickly. Flirtatiously, she whispers that she likes that in a man. However, her amorous banter is cut short by the scent of cologne on the wind. At the power plant, Donatello is overseeing the reconstruction and he isn’t pleased. He thinks the idea of ceiling off radiation with concrete is crude and that the entire ordeal reminds him too much of Chernobyl. His finger-wagging is interrupted by a large glowing orb that mysteriously appears before him. Don isn’t sure if it is something demonic leftover from their previous battle or a form of radiation oozing from the power plant. As the sun sets, Leonardo and Splinter continue their duel. 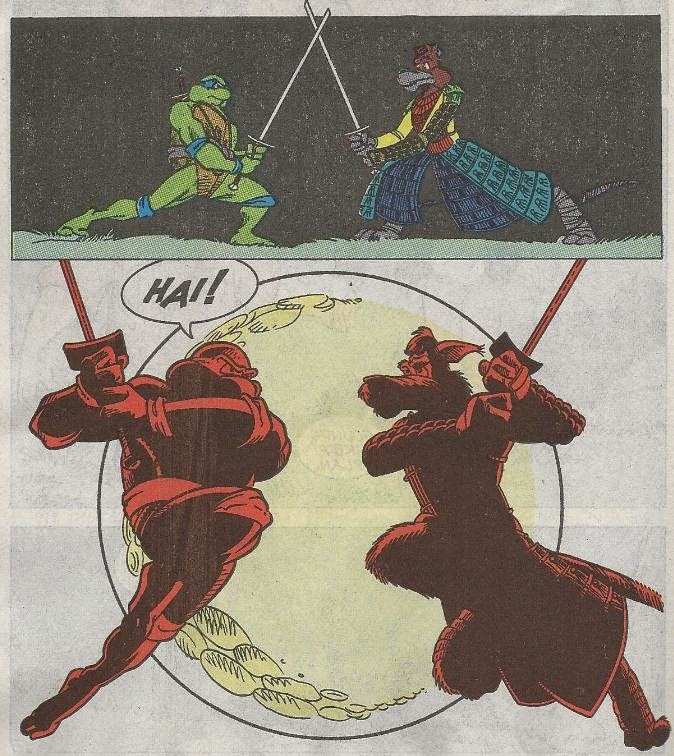 Splinter knocks the katana from Leo’s hand and reminds him of his lessons. On a hilltop, Oyuki and Mike fly a kite, discussing poetry all the while. Oyuki thinks it’s cool that Mike is into that sort of stuff and the pair begin spouting off goofy haikus. 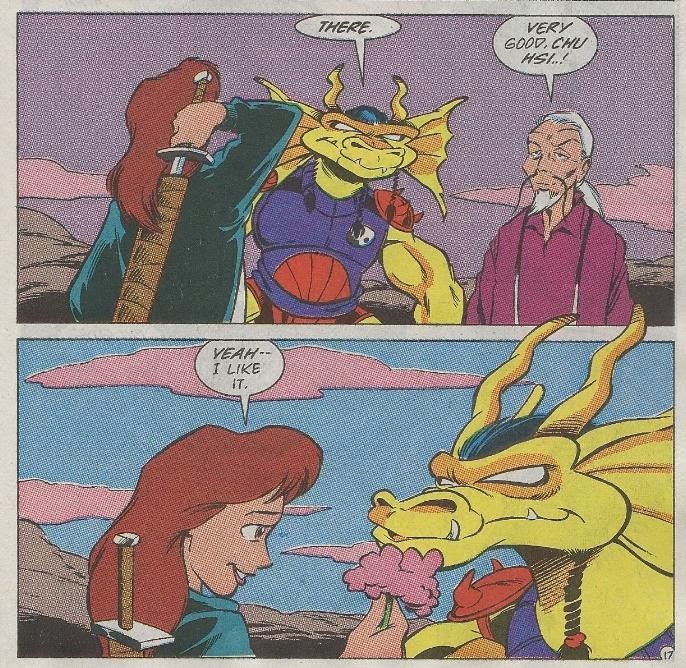 Elsewhere, Fu Sheng continues to train Chu in controlling the Warrior Dragon as April practices her swordplay. After much effort, Chu manages to transform into the Dragon without growing to skyscraper size. April is impressed and offers him a flower as congratulations. Back at the torii, Raph and Ninjara are attacked by a gang of thugs; the same thugs that attacked Raph and his brothers in the sewers when they first arrived in Japan. As they take the thugs out with ease, one of them refers to Ninjara as “the greatest thief in all Japan”. Raph is honored to be in her presence. Don opens up a dialogue with the glowing orb, which reveals itself to be the dual spirits of Yin and Yang. Don follows the orb up a hillside overlooking the concrete radiation enclosure. Before vanishing, the orb tells Don that “every saving has its cost”. Don looks upon the lid of the enclosure, seeing it resemble the yin-yang symbol. And at the torii, Raph and Ninjara clean up the last of the thugs, though as the final one passes out, he groans that he had actually come to Ninjara for help. Ninjara brushes his words off and wraps her arms around Raph; the fighting having gotten her all frisky. Speaking of “frisky”, April and Chu are busy making out in front of a full moon. April regrets the kiss as soon as it happens and asks Chu if they can slow down. Chu understands, and together they decide to pay Sheng back for the lunch by taking him out to dinner. And elsewhere, still practicing, Leo finally forces Splinter to a draw when their katana both shatter upon impact. Splinter reassures Leo that they will acquire a new pair and compliments him on his progress. High above Japan, the spirit of Yin and Yang transform into the spectral forms of Izanami and Izanagi. 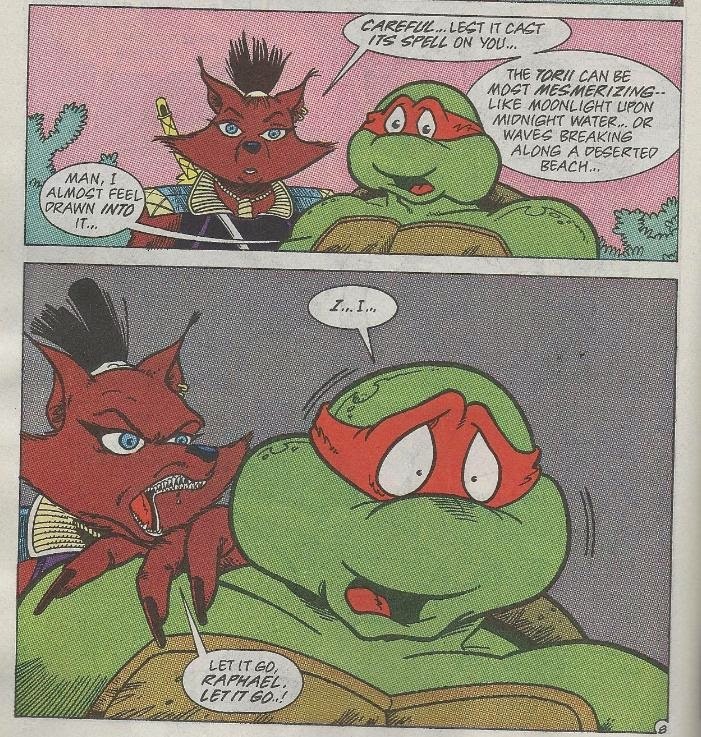 *This story is continued from TMNT Adventures #30. The story continues in TMNT Adventures #32. *The torri's ability to reach the Underworld will be seen in TMNT Adventures #46. *Raph and his brothers faced the street thugs in TMNT Adventures #28. *Mike’s interest in poetry and writing seems to have seeped over from his Mirage counterpart. He was shown taking in interest in the hobby in TMNT (Vol. 1) #17 and, much later, made a career of it in TMNT (Vol. 3). *This issue was reprinted in the UK by Fleetway in TMHT Adventures #58. So after this “epic” three-part story arc, we get a relaxing breather issue in “Turning Japanese”. I enjoy breather issues, personally, as I don’t really cotton to the idea that every single little thing these characters do has to result in a world-shattering crisis, and when you’re as fond of these characters as I am, even watching them doing mundane things like picnicking and kite-flying is entertaining. Granted, I wouldn’t want to watch that sort of thing all the time, but one-off stories that give the characters a brief pause are always welcome in my longbox. “Turning Japanese” seems to place a heavy focus on romantic character pairings, so fangirls take note, the genesis for your “shipping” fanfics begins here! Of the three potential “romances” introduced in this issue, we get a mixed bag of “innocent and probably just good friends” to “hey, this could work out” to “awkward and forced”. Mike and Oyuki hanging out gets the shortest straw of the subplots in this issue, but it was nice to see Mike doing something other than talk about pizza… even if he ended up talking about pizza, anyway. Raph and Ninjara is a romance I can tolerate, even if it never felt natural at all. They’re all over each other in this issue, but that’s not what bugs me the most. As I mentioned briefly in my last review, the other characters seem to instantaneously forgive Ninjara for attempting to kill the entire human population of the Earth, and solely to facilitate an unhindered romance for Raphael. Then there’s Chu and April, which actually works out pretty well, even if the characters didn’t get a whole lot of “alone time” in the past. Still, April went through Hell to rescue him over these past few issues and Chu doesn’t have any baggage like attempted global genocide for Clarrain (Murphy) to brush under the rug, so maybe it just felt more natural by comparison. Also, I just want to say that Allan draws my favorite version of April ever. All of the proper April elements are there, but she isn’t stuck with an ugly dated hairstyle like Mirage April or a ridiculous outfit like Fred Wolf April. She’s pretty without being ridiculously “hot” like Image April and she isn’t overly stylized like “Back to the Sewers” April. I suppose the only runner-up is April’s initial design from the 4Kids cartoon, though that one made her seem a bit too young. Allan’s April is just perfect on all counts. Leonardo’s subplot suffers from the fact that Leonardo’s only personality trait is “serious leader”, so all you can ever see him doing alone in his spare time is training. That can often be very, very boring, but the presence of Splinter punches it up. 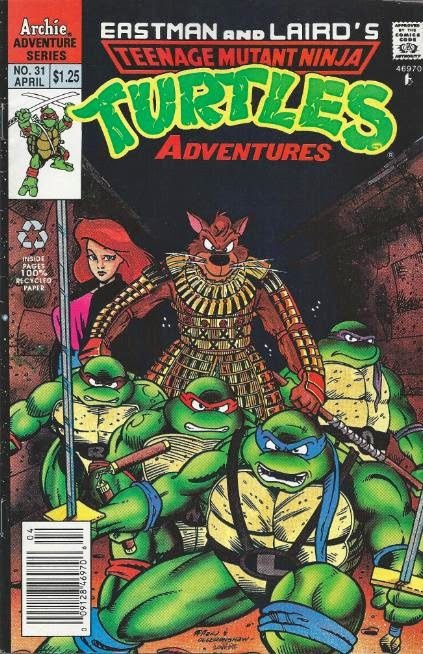 I totally dig Splinter’s samurai armor, though that’s kind of a silly thing for a “ninja” to wear. Also, immediately after typing the above sentence, I remembered Shredder’s pseudo-samurai getup, so I’ll just be quiet. And last but not least, there’s Don, injecting the mandatory eco-awareness subplot. He continues the previous story arc’s condemnation of nuclear power, now criticizing the manner of enclosing radiation leaks with concrete, refusing to accept such a “handyman” tactic as sophisticated-enough to do the job. I didn’t know Clarrain was such an expert on the subject. Why is this man wasting his intellect on children’s comics when the world of nuclear safety engineering clearly needs him!? The message that Yin-Yang/Izanami and Izanagi try to impart on Don I suppose could be left up to interpretation; all things are one and every benefit has its drawback. I took that to mean that yeah, we enjoy the energy that nuclear power provides us, but unfortunately we’re all going to die horribly in inevitable nuclear meltdowns because every nuclear power plant is just a potential Chernobyl waiting to happen. This is Clarrain’s idea of subtlety, people. The Yin-Yang message is even further encapsulated in this issue, in that for every entertaining subplot, there is an equal number of awkward and preachy subplots, too. I wonder if that was intentional? This issue had one of those really basic but memorable covers with our six main protagonists (up to this point) posing dramatically and Splinter all decked out in his "samurai" ninja gear (lol). If I remember, we started to see less and less of April from this point in the series, as Ninjara supplanted her as the female lead. It's too bad, since I really liked what the series was doing with April's character development into a real hero who could still succeed at a real job.